LANDOVER, Md. Robert Griffin III and Alfred Morris needed only four months to put the Washington Redskins in a place they haven't been this millennium: on top of the NFC East. Led by a pair of rookies serenaded loudly and lovingly by the hometown crowd as "R-G-3!" and "Al-fred Mor-ris!," the Redskins claimed their first division title since 1999, beating their archrival Dallas Cowboys, 28-18 Sunday night in a winner-take-all finale to end the NFL's regular season. Griffin, the Heisman Trophy winner drafted second overall, ran for 63 yards and a touchdown. Morris, the out-of-nowhere sixth-rounder from Florida Atlantic, ran for 200 yards and three scores. He set the franchise single-season rushing record for the Redskins (10-6), who revived the season behind their quarterback's talent and leadership to win seven straight wins after their bye week. They are the first NFL team to rally from 3-6 and make the playoffs since the Jacksonville Jaguars did it in 1996. "I could never imagine coming in here my rookie year and doing what I've been able to do," Morris said. "It's better than my wildest dreams." After the final whistle, team captain Griffin walked off the field with a big smile, holding up his left index finger in a No. 1 gesture. He then held his left fist aloft. "These aren't ordinary rookies," cornerback DeAngelo Hall said. "For a guy to win the Heisman Trophy, be the top pick, the savior of the franchise, come in here so humble -- from Day 1, he came in here working -- that's why he has that 'C' on his chest." 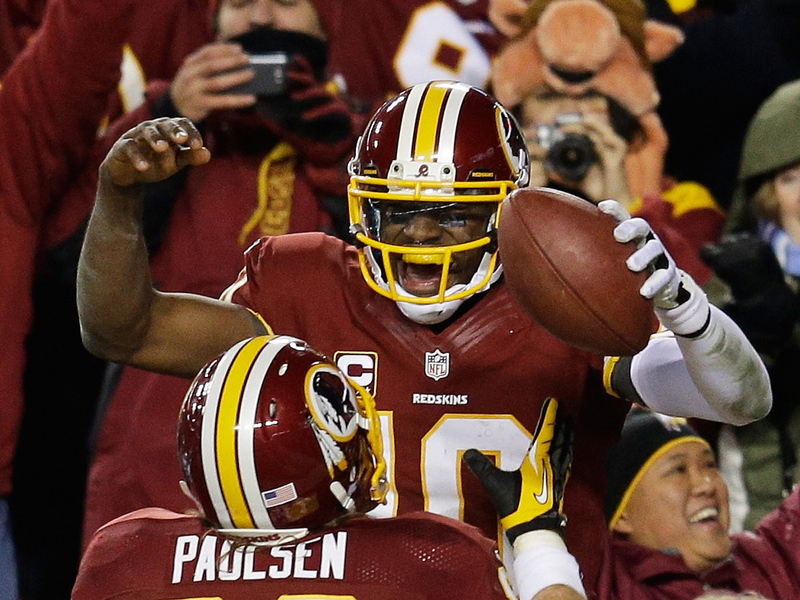 Washington will host Seattle next Sunday, the Redskins' third consecutive playoff game against the Seahawks. They lost at Seattle in 2005 and 2007. "I've been here for the 4-12, the bad times, almost being the joke of the NFL," said defensive lineman Kedric Golston, one of the team's longest-tenured players. "But to do this with this group of guys -- the old and the new -- it's good to be here." The Cowboys (8-8), meanwhile, missed the playoffs for the third straight season, having stumbled in a make-or-break end-of-regular-season game for the third time in five years. Tony Romo threw three interceptions, matching his total from the last eight games combined. A poor throw was picked by Rob Jackson when the Cowboys had a chance to drive for a winning score in the final minutes. Romo almost became the first Dallas quarterback to throw for 5,000 yards in a season, but his career is instead further tainted by post-Christmas disappointments. He also had Week 17 losses to the Philadelphia Eagles (44-6) in 2008 and the New York Giants (31-14) last year, as well as his 1-3 record in playoff games. Morris finished with 1,613 yards, topping Clinton Portis' 1,516 in 2005. He was especially dominant in the Redskins' go-ahead drive in the third quarter, when six plays were runs by Morris and the other three involved fake handoffs to him. The touchdown came when Griffin faked to Morris -- one of several times linebacker DeMarcus Ware was totally fooled by deception in the backfield -- and ran 10 yards around the left end. It put Washington ahead 14-7 in the third quarter. The Cowboys answered with a field goal early in the fourth, but Morris' 32-yard scamper gave the Redskins a 21-10 cushion with 10:32 to play. Trying to play catch-up, Dallas pulled within three on a 10-yard pass to Kevin Ogletree and a 2-point conversion with 5:50 to play. But Morris' third touchdown, a 1-yard run with 1:09 left, sealed the win. Playing against a defense missing its five best run defenders, the Redskins didn't need Griffin to throw much. He completed just 9 of 18 passes for 100 yards. The Redskins were calling designed runs for Griffin as a regular part of the game plan for the first time since he sprained his right knee four weeks ago. He lacked the explosiveness he showed earlier in the season, perhaps hampered by his big brace, but he was still a running threat. Romo completed 20 of 31 passes for 218 yards. The Cowboys also dealt with in-game injuries to receivers Miles Austin (left ankle) and Dez Bryant (back). Bryant, who had a torrid second half of the season despite breaking his left index finger, had four catches for 71 yards. The Redskins also set a franchise record for fewest turnovers in a season with 14, fewer even than the 1982 team that played only nine regular-season games because of a players strike. Griffin and his teammates had other plans, and the coach quickly changed his tune. Now, the Redskins are in the postseason for the first time since a wild-card berth under Hall of Fame coach Joe Gibbs in 2007.